There is almost a collective sense of spurious satisfaction in Myanmar over the refusal of the 700,000 Rohingyas to return from the squalid camps of Bangladesh. Equally, much as it hoped to start the repatriation very shortly, there is little doubt that the government in Dhaka must be sorely disappointed ~ a month before the national election ~ that rehabilitation across the fence is still a long way away, if at all. Ergo, the resultant pressure on the economy and infrastructure is likely to persist for a long while yet. The repatriation plans were scrapped on Thursday not the least because there is not a single refugee who wants to return to his roots in Myanmar. “The refugees are not willing to return now,” was the lament of the Bangladesh Refugee Commissioner, Abdul Kalam. That statement of fact has been couched in the admission that the government “can’t force them to go, but will try to motivate them so it happens”. It is direly unlikely to happen quite yet, which in itself mirrors at least two facets to the crisis ~ the policy of persecution of the Rohingyas almost as a matter of state policy, verging on what the UN calls “ethnic cleansing” and in parallel, the calculated absence of rehabilitation infrastructure, not to ignore the intriguing silence of Aung San Suu Kyi. The fineprint of the latest development is that the refugee has spoken after being buffeted from shore to shore in search of hearth and home. The eloquent message of the “nowhere man” must resonate both in Myanmar and Bangladesh. It is a measure of man’s inhumanity to man that the squalor and privation in one country may appear to be preferable to the persecution and yet another bout of homelessness in another. The Myanmarese army is a law unto itself and Suu Kyi can do but little to stop the pogrom against the Rohingyas. The grim reality is painfully clear to the refugees. “We won’t go!” was the chant in chorus of hundreds of voices, including children’s, to Bangladesh’s assurance ~ “We have arranged everything for you, we have six buses here, we have trucks, we have food. We want to offer everything to you. If you agree to go, we’ll take you to the border, to the transit camp.” Comfort while in transit is not central to the issue. The government’s assurance, amplified through the tannoy at the Rohingya settlements in Cox’s Bazar, has turned out to be shambolic. Neither the administrations in Naypyidaw nor Dhaka can be unaware of the contention of human rights activists that conditions are far from safe for Rohingya refugees to go back. 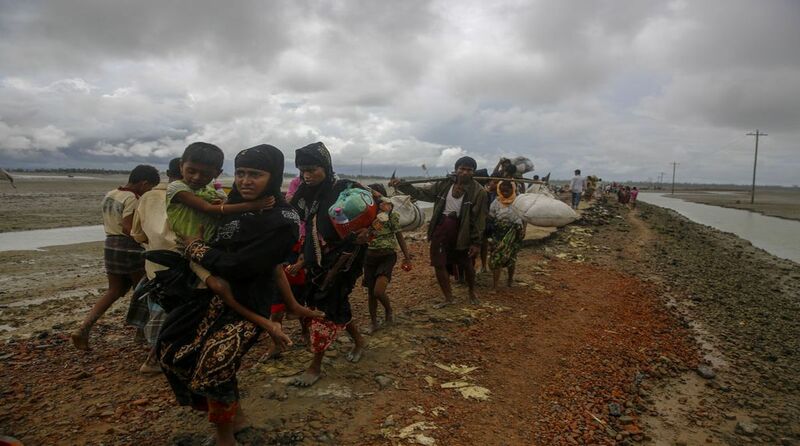 “Nothing that the Myanmar government has said or done suggests that the Rohingyas will be safe upon return,” Human Rights Watch refugee rights director, Bill Frelick, said in a statement in the wake of Thursday’s robust refusal to return.